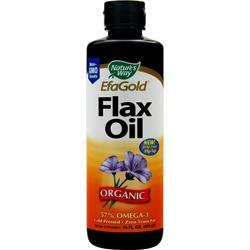 Nature's Way EFA Gold is the highest quality flax seed oil, and one of nature's richest botanical sources of healthy Omega-3 essential fatty acids. Other Ingredients: Organic Flax Oil (seed), Antioxidant Blend (Rosemary, Mixed Tocopherols, Ascorbyl Palmitate, Citric Acid). Take 1 tablespoon (15 mL) 1 to 3 times daily. May also be used in salad dressings, dips and spreads; on bread, rice and pasta or stirred into yogurt, cottage cheese, juice or cold beverages. Keep refrigerated.